Who would have thought that an inch-thick tape would create so much buzz among sports doctors, therapists, and athletes all over the world? According to www.kinesiotaping.com, Kinesio Taping has become “the gold standard for therapeutic rehabilitative taping.” Invented by a Japanese doctor almost three decades ago, the elastic tape “corrects muscle function, improves circulation of blood and lymph, repositions the joint and relieves pain.” Woaah, tall order for a tape that initially came in only funky colors like hot pink and blue colors (now there’s beige and black), but as world-class athletes such as Lance Armstrong, Tiger Woods and David Beckham swore by the tape, more athletes and sports enthusiasts have become believers. I got taped myself before the Clark race. My therapist said it would help my weak leg muscles and provide support 24 hours a day. I could keep it on for up to 5 days—bathe, swim, or run with it without restricting movement. It felt comfortable, like second skin, really. Plus, I felt cool knowing Lance and I finally have something in common! “Thank you so much for working with me two times in one day, and on such short notice. The magic you worked – adjusting me, and the “Volleyball” tape worked wonders and I was able to run the entire Rock N Roll Marathon! I had a slow and consistent pace for the entire race, and was able to run all of it and not have to walk at all. Even at miles 20 through 26 where runners typically are not doing so well, I was feeling great and running strong! As I ran, I kept remembering the quote, “Pain is temporary. Pride is forever.” As I thought about that during the race I couldn’t help but be thankful that I had no pain in my knee. I am so proud to have run all 26.2 miles, and am grateful that you were a big part of my first marathon. May I ask for contact details of Dr. Canlas’ clinic? 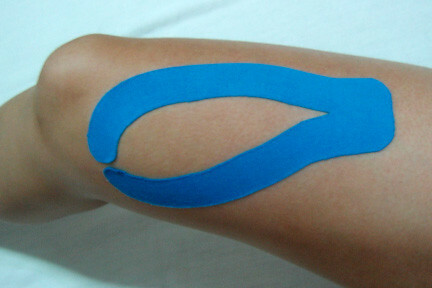 I’m interested to buy kinesio tapes… Kindly text me thru 0922-4645900, thanks! been using it for about a year now! probably saved my military career and some exploratory sugery! Is that what that is. I’ve seen it here but so far only from the Asian runners. ben was just telling me about this awhile ago. galing nito! and the cost? hope kinesio taping(basically non-restrictive which allows full ROM) does you real good. I occasionally do it for a tennis elbow.oh dear, did you say, no more racing? take it easy. Ben, yup it’s like magic tape for injured runners like us! Bealtea, I wore it under leggings in the race. I just ran 10k so I didn’t get tan lines. Taki, if I’m not mistaken only Dr. Canlas’ clinic has it for now. Tina, yup it’s complicated. The therapist had to identify exactly where to put it, cut and shape the tape following the muscle. I’d say don’t try it at home! haha. They even have certified kinesio tapers (or whatever you call ’em) abroad. cool. i saw this in amazon. but there are all sorts of books on how it should be used. is it really that complicated?! looking at your plaster, it seems there is a special way of taping depending on what hurts. not as simple as salompas. Wow! Is this for real?? Where did you buy the tape? you wore this during the race? did you get tan lines or did you wrap another tape over it? hmmmm……. A tape can do that????? geeezzzzz!!!! Tape lang!?!?!?! Goodluck with the recovery and therapy miss jaymie!